One of my all-time favorite furniture details is tone on tone. This look is so elegant and sophisticated it works with most rooms and styles. 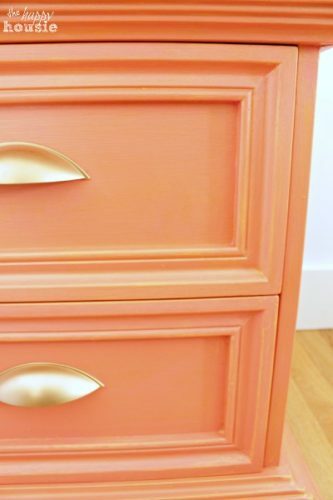 It’s not always the easiest look to pull off perfectly, so I definitely suggest practicing before you take your skills to a prized piece of furniture, but here are the steps to help you along the way. When I mention tone-on-one color, most people think two-tone colors, but these two techniques are very different. A two-toned paint job is simply using two different colors. Tone on tone is a layering technique that takes one or two colors and uses those same colors to create different effective. It is similar to a monochromatic effect. The result is absolutely breathtaking. 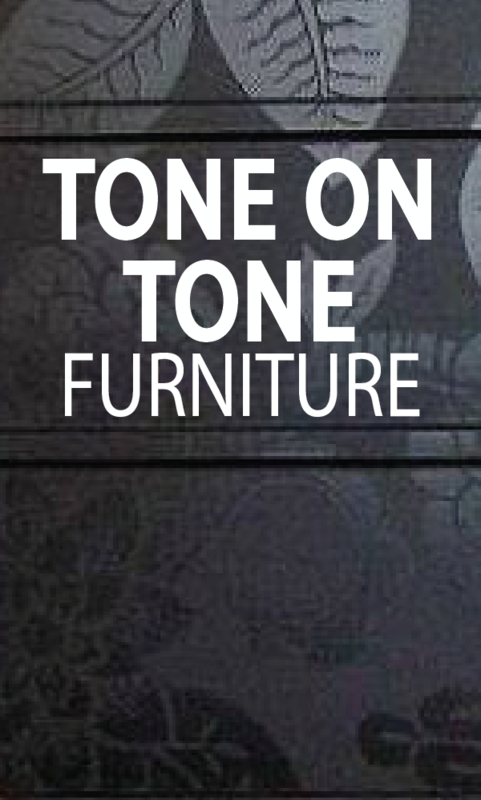 Tone on tone works with nearly any type of furniture, but is absolutely beautiful on dressers and tables. 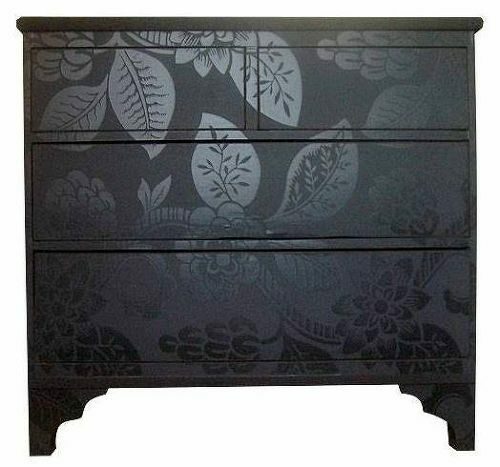 This dresser was painted in a basic grey on the bottom and a darker version on top. 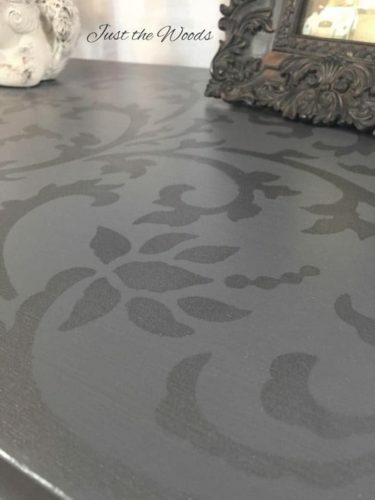 Then a stencil was used with a dark metallic silver to create a stunning tone on tone effect. I love how justthewoods.com made the stencil look change slightly as the light hits it in different ways. Another type of tone on tone is to use a glaze that is in the same color family as your paint choice. 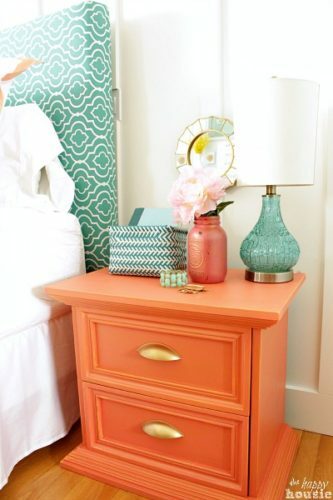 The Happy Housei made this beautiful nightstand. It was originally painted a bright coral, but then accented with a gold glaze. The effect is an absolutely stunning finished piece. 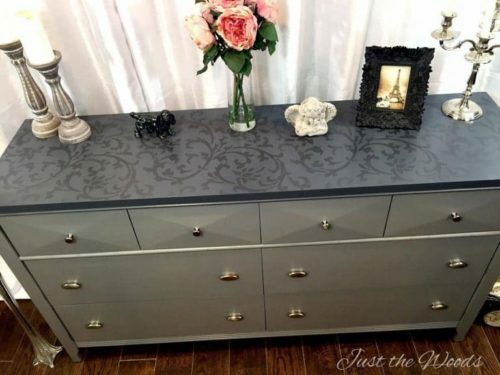 Stencils aren’t just for table and dresser tops, you can use that technique to transform the entire front of your dresser. This matte and glass combination takes an otherwise plain black dresser and completely transforms it into a custom piece. This is another example of a stencil in another style. The gold and silver combination is elegant and stately, perfect for a master bedroom, guest bedroom, or even foyer. 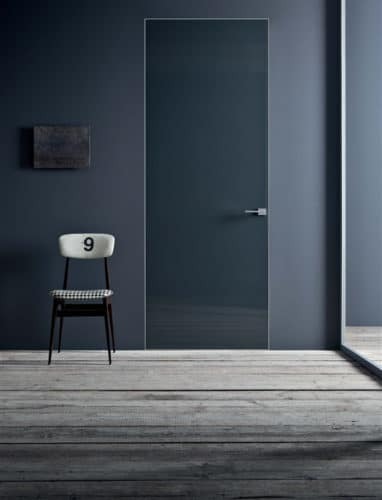 I know, this isn’t exactly furniture, but it shows the juxtaposition of glossy vs. matte paint in a space. Both colors are a steamy charcoal grey, but the difference in sheens makes a huge impact to the space. You can use glossy on the top and side and matte on the front or vice versa, depending on the style of furniture piece you’re transforming. 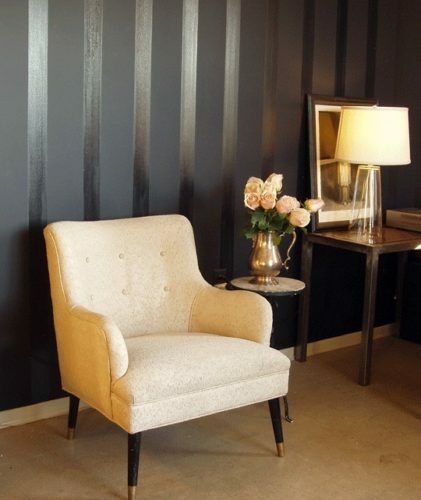 One of my favorite ways to use tone on tone is to create stripes. This works beautifully on nightstands, tables, dressers, and of course, walls. When completing this technique, paint the matte color first, and then top with the high gloss tone. Beautiful! I love these great examples of tone on tone. Some of these images are not my handiwork, but are celebrities on pinterest because of their beauty! I love looking at what other people have done with tone on tone, to inspire me on my next project. If you have a tone on tone project you have done, send me a comment or post a picture for me to see. Antiqued items are more popular than ever before and antiqued dressers are leading the bandwagon.